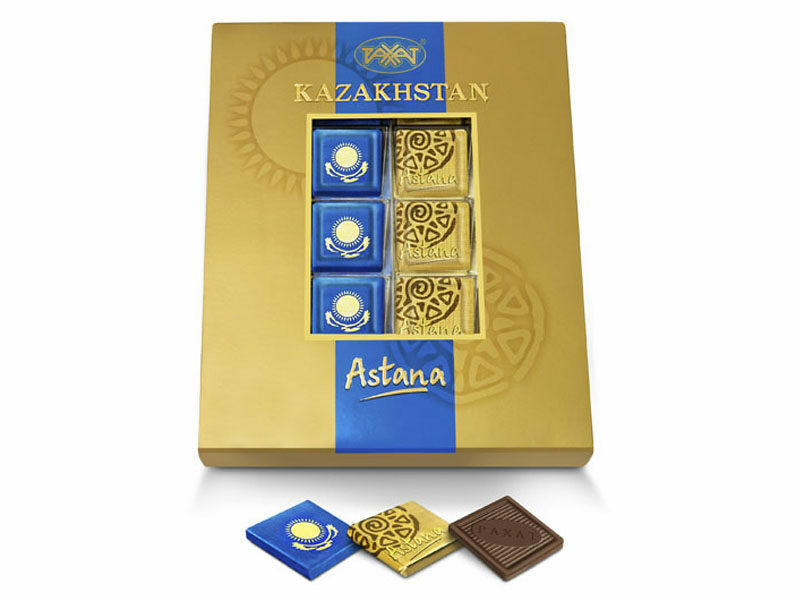 Set of two kinds of chocolates: «Kazakhstanskiy» natural chocolate with high content of cocoa mass, with the adding of milk, with vanilla aroma; and «Astana» bitter natural chocolate with high content of cocoa products (more than 75%), without addings. Ingredients: sugar, cocoa mass, cocoa oil, whey solids, whole milk dried, emulsifier: soy lecithin, extract of natural vanilla is intensifier of taste and smell. Cocoa product content is not less than 45%. Ingredients: cocoa mass, sugar, cocoa oil, cocoa powder, emulsifier - soy lecithin, common salt, extract of natural vanilla is intensifier of taste and smell. Cocoa product content is no less than 75%. Storage temperature is (8-23)°C, relative air humidity should not exceed 75%.